The histories of Twitter and Twitterrific are closely tied. 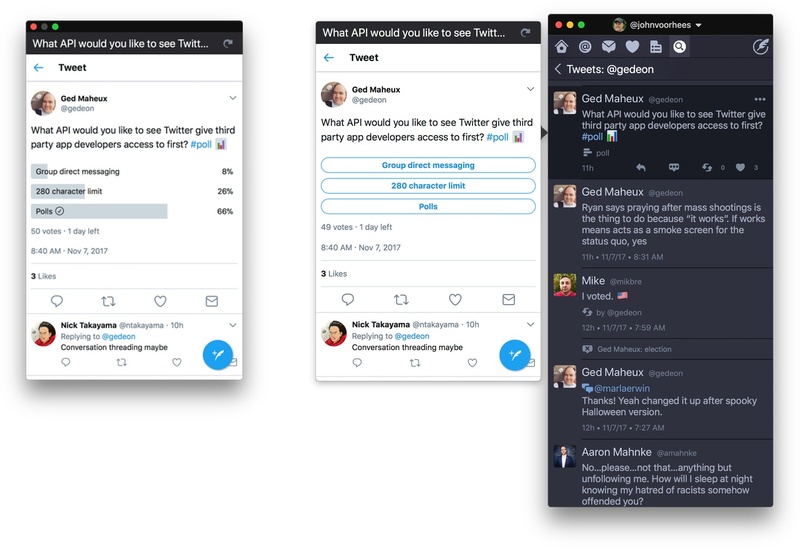 Twitterrific was the first Twitter client on the Mac in 2007 and later on the iPhone, coined the term ‘tweet,’ beat Twitter to a bluebird icon, and more. 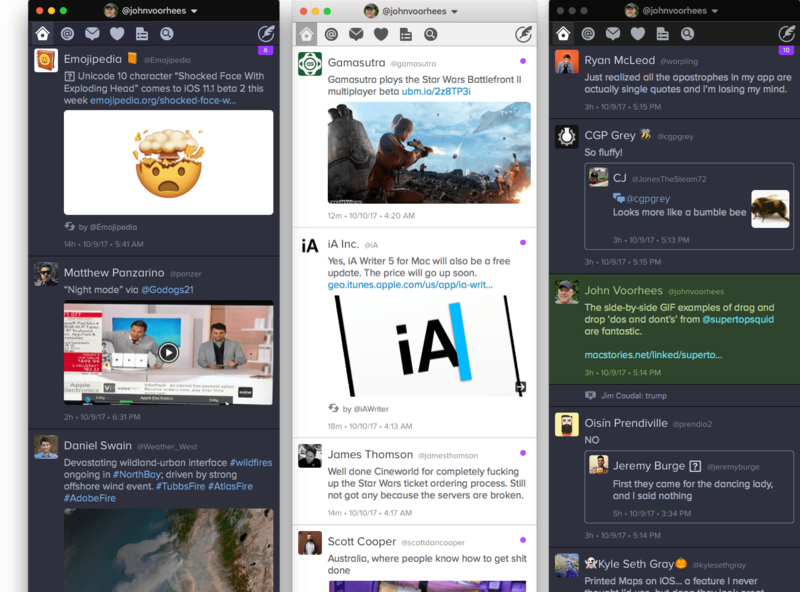 Until 2013, Twitterrific for the Mac was developed in tandem with the iOS version, but the pace of iOS’ evolution led The Iconfactory to suspend development of the Mac version. 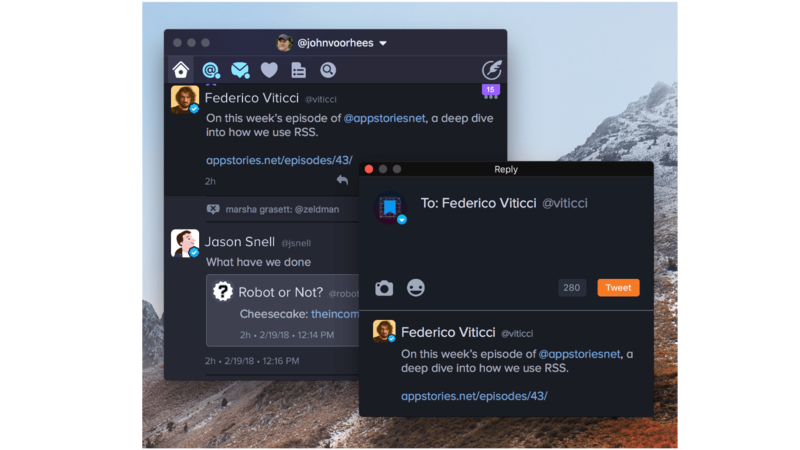 Today, The Iconfactory unveiled a Kickstarter campaign to reboot Twitterrific for the Mac. 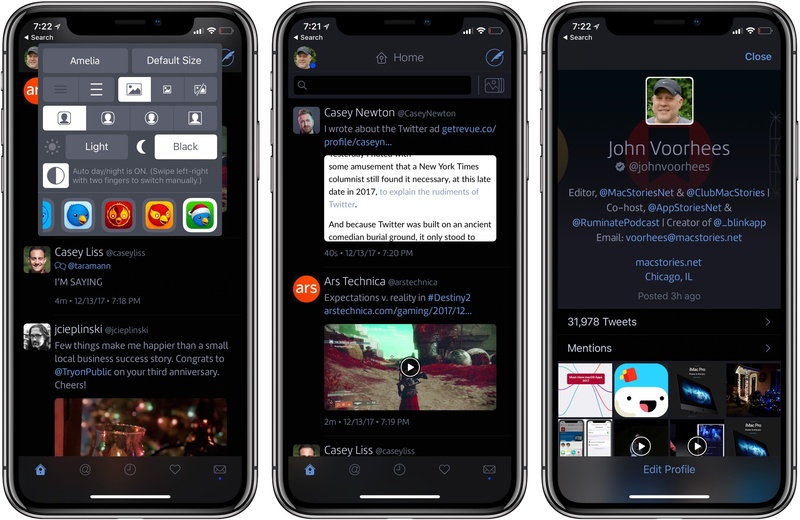 The campaign, which seeks to raise a minimum of $75,000 or more with stretch goals, aims to rebuild Twitterrific from the ground up for macOS. The goal is to build a solid, simple foundation on which The Iconfactory can iterate and eventually match the iOS version’s functionality. That means that not every imaginable feature will be included initially, but based on the list above, most of the core Twitterrific experience will be included if the project is funded. Additional features will be added if funding reaches $100,000 and $125,000. My only quibble with the goals as structured is that direct messages feel like something that should be included in the initial goal, not a stretch goal. I like Twitterrific for iOS a lot, especially Center Stage, its new media browsing feature. 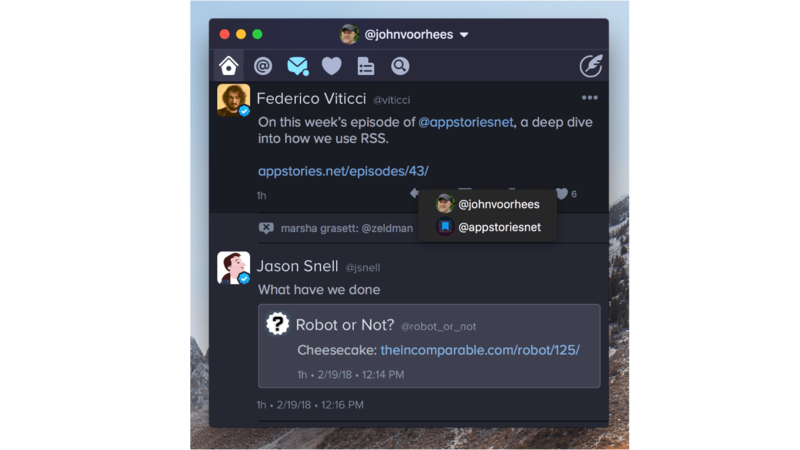 However, as someone who uses a Mac and iOS devices daily, the lack of updates to Twitterrific for Mac has played a significant role in preventing me from considering it as my primary Twitter client. Consequently, I was excited to hear the news about Project Phoenix. I would like to have seen mockups of what The Iconfactory has planned, but even without that, I immediately backed Project Phoenix based on the great work The Iconfactory has done on the iOS version and its other apps. You can watch the video introducing Project Phoenix, read more about The Iconfactory’s plans, and check out the rewards for each backing level on Project Phoenix’s Kickstarter page. 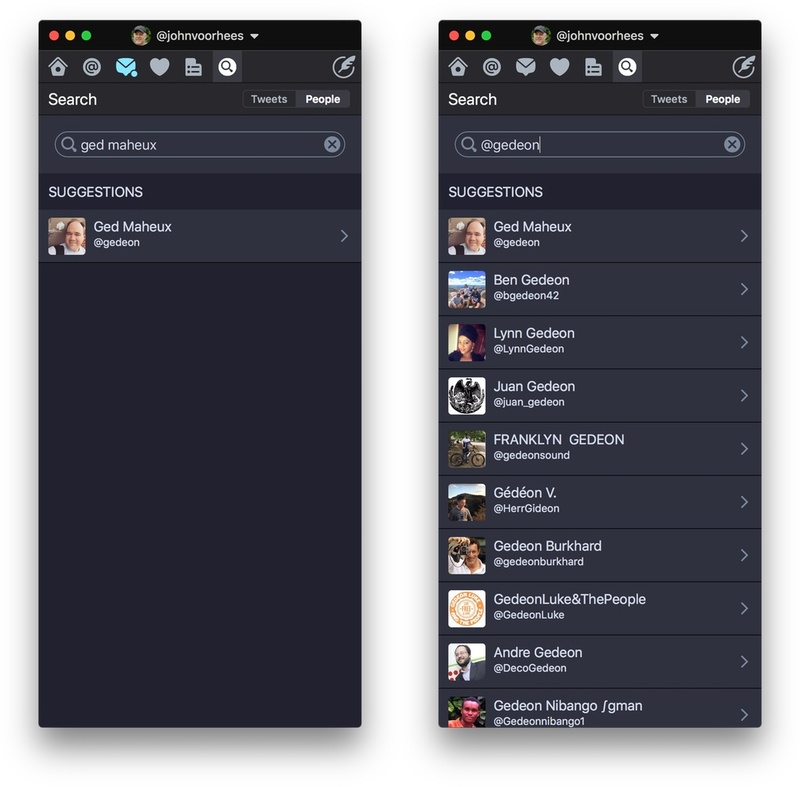 Solid update to the Twitter client by The Iconfactory: version 5.14 of Twitterrific brings a redesigned and customizable Today screen to view an activity summary for the selected account (with a counter for quoted tweets, too), better support for 3D Touch to peek at events in the timeline, a watchOS 2 app, and the ability to preview recently shared media in profile pages. I don't use Twitterrific as my main client – I prefer Tweetbot – but choosing between the two is largely a matter of minor preferences at this point (one of mine: Tweetbot lets me see people who retweeted and faved one of my tweets from the tweet detail view). It's great to see that The Iconfactory is getting rid of many of the old annoyances of Twitterrific: DMs are now excluded from the unified timeline (I criticized this here), the tab bar supports 5 buttons on iPad, where you can also choose to show it at the bottom in portrait (previously, the feature was iPhone-only). Great changes. Twitterrific 5.14 is available on the App Store. 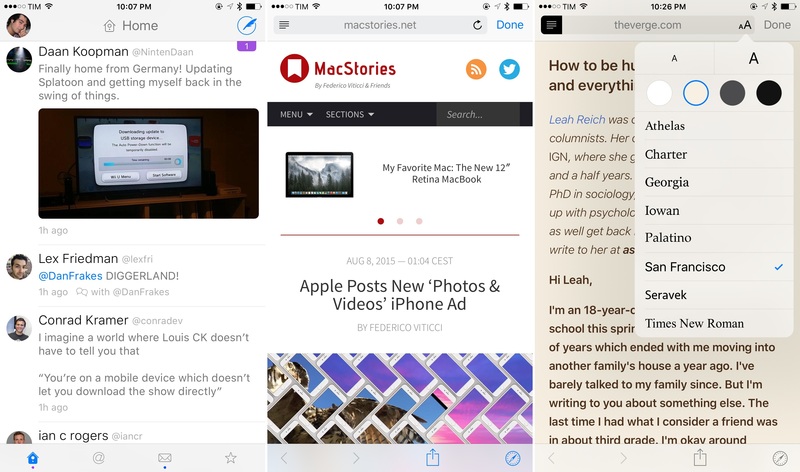 San Francisco, Safari View Controller, and Safari Reader in Twitterrific 5.13. 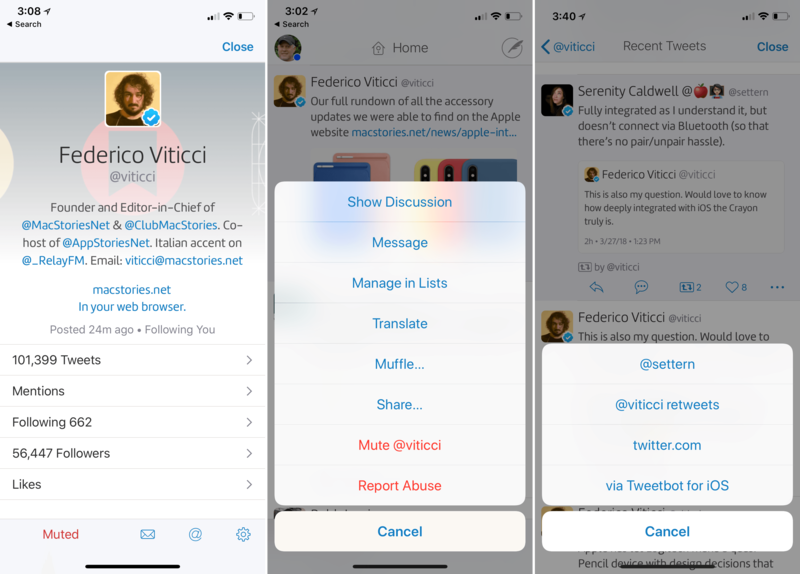 The latest version of Twitterrific, released today on the App Store, brings a number of nice improvements such as hashtag autocompletion, better support for Handoff, and some welcome fixes for quoted tweets and the media viewer. 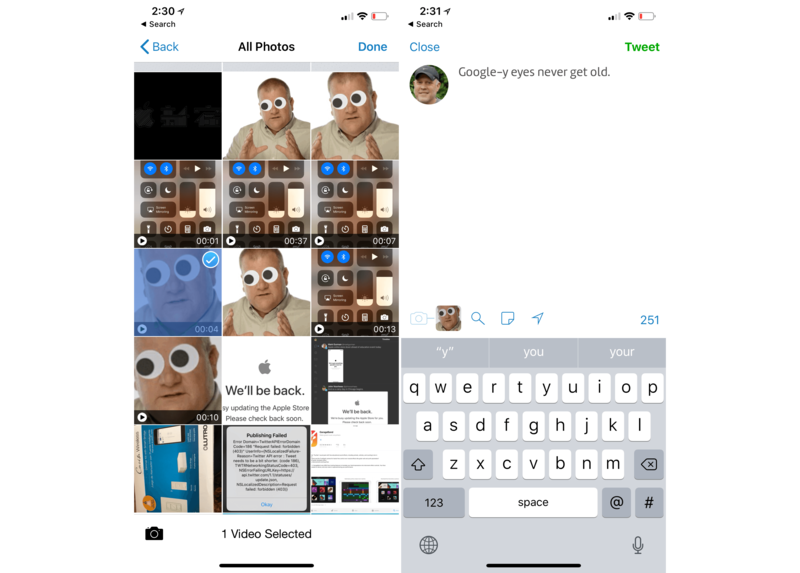 What's even nicer is that, if you're running the iOS 9 beta, Twitterrific for iOS 8 already supports Safari View Controller and the San Francisco font thanks to some clever coding by The Iconfactory.